Changing a behavior cannot be accomplished overnight. Whether individuals want to change their eating habits or begin exercising daily, it takes a lot of time and effort to implement it as a lifestyle. But for people living with type 2 diabetes, not changing certain behaviors can become life threatening. That’s why Alivio Medical Center with its Compañeros en Salud team has partnered up with the American Academy of Family Physicians Foundation and its Peers for Progress program to do just that, change behavior. 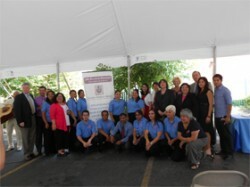 The 36-month project is aimed to improve the health outcomes of Latino Chicagoans living with type 2 diabetes. Despite this, Alivio and Compañeros en Salud have strategically partnered these patients with peers of similar backgrounds in hopes of ultimately getting them to better self manage their diabetes. The Peers for Progress program will not just allow for medical professionals to track changes in behavior but also to see how peer-support affects their decisions and offer health and nutrition advice to help patients make healthier choices. Velasquez said there are nearly 4,000 Alivio patients living with diabetes and she along with Ballesteros understand that people living with diabetes live with it 24 hours a day, seven days a week and when patients leave a clinic they face a vast array of issues that can’t be tackled with a ten minute visit with a medical provider. However, they remain optimistic in the project and the mission. “I feel confident that we can prove in two years that our patients when they receive this type of service of peer support it will actually show that they are managing their glucose and monitoring it at home,” Ballesteros said. “We are moving towards a new model of healthcare delivery in this country,” she added.